In Eastern Europe the later part of the Mesolithic lasted far longer than it did in Europe, with the arrival of agriculture only very slowly gaining a foothold in the region. This undoubtedly resulted from the harsh climate making farming much more difficult [10-13]. While the majority of Southern, Central, and Western European cultures had transformed into agricultural societies by 7,000 years ago, the people of the present-day Russia and Ukraine remained primarily hunter-gatherers. Many of these hunter-gatherer societies had adopted technologies from agricultural societies to the west, and clearly had contacts with the rest of Europe. Pottery began to appear, which had previously been associated with farmers . The peoples of present-day Southern Russia inhabited an open environment and turned to a nomadic culture alongside the domestication of the horse. Some of these nomads began producing copper ornaments and A particular cultural period known as the Khvalynsk appeared between 7,000 to 6,500 years ago in Southern Central Russia. They were known for producing multiple types of copper ornaments . The Khvalynsk people formed one of the precursor cultures similar to the Sredny Stog people of present-day Ukraine. These early nomads would eventually become part of the Kurgan Culture who later invade Central Europe [16-19] and are thought to be a source in early Indo-European languages. 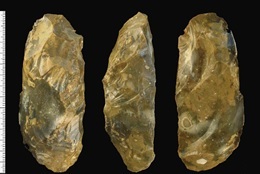 The three individuals in this sample came from the Khvalynsk II archaeological site found on the Volga River in present-day southern Russia near the village of Alekseevka. The site was radiocarbon dated to between 7,200 and 6,000 years ago. Found at the site was early evidence of domesticated cattle, sheep-goat, and horse as well as significant numbers of copper artifacts such as beads and rings . Genetic analysis has shown that these individuals represent early steppe peoples that were descended from earlier hunter-gatherers in the region . Their genes spread west into Europe in later millennia after the spread of the Kurgans and can be found among people of European ancestry today. All three of these individuals were male. Two of these individuals belonged to the U mitochondrial haplogroup, which was a common lineage among European Paleolithic hunter-gatherers . 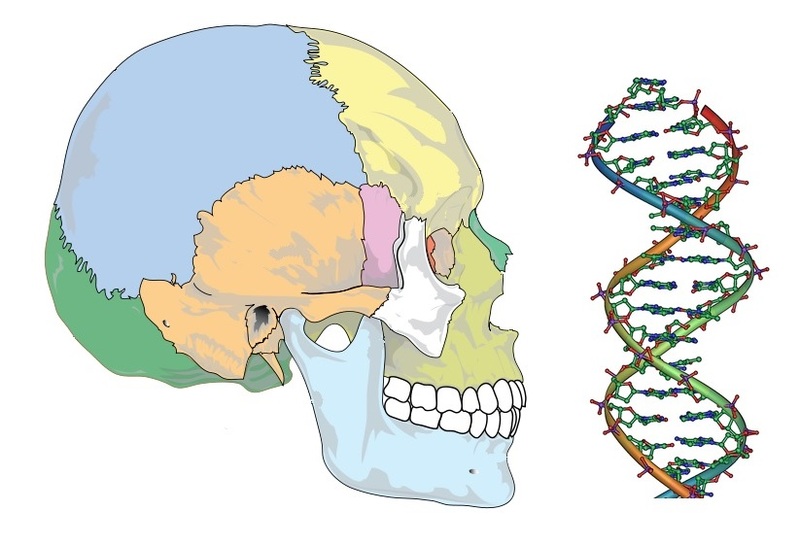 The remaining individual belonged to the H mitochondrial haplogroup, which is thought to have Paleolithic Middle Eastern origins . This lineage spread into Europe and the Caucasus during the Paleolithic but became more common in Europe after the Neolithic. Two of the males belongs to the Y chromosome haplogroup R1, which is common today throughout the world and belongs to a very ancient lineage thought to have arisen in Southeast Asia during the Paleolithic . One male had a Y chromosome lineage that belonged to the Q haplogroup, which is most common among Native Americans today and extremely rare among Europeans. This lineage was thought to have arisen in the Altai Mountain region of Central Asia . 1. Greenfield H. 2006. The spatial organization of Early Neolithic settlements in temperate southeastern Europe: a view from Blagotin, Serbia. In: Robertson JDS Elizabeth C, Fernandez Deepika C, Zender Marc U, editors. In Space and Spatial Analysis in Archaeology. Calgary: University of Calgary Press. pp. 69–79. Taylor KC, et al. 1997. The Holocene- Younger Dryas transition recorded at Summit, Greenland. Science 6278: 825-827. Zvelebil M, Lillie M. 2000. Transition to agriculture in eastern Europe. In Europe’s First Farmers, T.D. Price, ed. (Cambridge University Press), pp. 57–92. Zvelebil M, Domanska L, Dennell R. 1998. Harvesting the Sea, Farming the Forest: The Emergence of Neolithic Societies in the Baltic Region (Bloomsbury Academic). Antanaitis I. 1999. Concerning the transition to farming in the East Baltic. Documenta Praehistorica 26: 89–100. Zvelebil M, Dolukhanov P. 1991. The transition to farming in Eastern and Northern European Journal of World Prehistory 5: 233–278. Matuzevičiūtė GM. 2014. Neolithic Ukraine: a review of theoretical and chronological interpretations. Archaeologia Baltica 20: 136–149. Chernykh EN. 2009. Formation of the Eurasian Steppe Belt Cultures. In Social Complexity in Prehistory Eurasia: Monuments, Metals, and Mobility. Hanks BK, Linduff KM (eds.) Cambridge University Press: Cambridge. pp.115-147. Anthony DW, Bogucki P, Comşa E, Gimbutas M, Jovanović B, Mallory JP, Milisaukas S. 1986. The "Kurgan Culture," Indo-European Origins, and the Domestication of the Horse: A Reconsideration [and Comments and Replies]. Current Anthropology 27: 291-313. Balter M. 2004. Search for the Indo-Europeans. Science 303:1323. Anthony DW. 2010. The Horse, the Wheel, and Language: How Bronze- Age Riders from the Eurasian Steppes Shaped the Modern World. Princeton University Press. Bouckaert R, Lemey P, Dunn M, Greenhill SJ, Alekseyenko AV, Drummond AJ, Gray RD, Suchard MA, Atkinson QD. 2012. Mapping the origins and expansion of the Indo-European language family. Science 337, 957–960. Matheison I, et al. 2015. Genome-wide patterns of selection in 230 ancient Eurasians. Nature 528: 499–503. Raghavan, M. et al. 2014. Upper Palaeolithic Siberian genome reveals dual ancestry of Native Americans, Nature, 505, 87–91.